On Saturday, August 14th, NASCAR Whelen All American Racing Series returned on Kids Night with the Western Late Models, Grand American Modifieds, Vintage Winged Modifieds, which featured Johnny Brazil, Bombers, Basically-4-Cylinders, Legends of the Pacific and Mini Cups. Plus Big Wheel races for the Kids. All this action was Presented by Ghirardelli and Stockton Food for Less. This would be the night that Brentwood’s Doff Cooksey (75) would measure up to the field and bring his Western Late Model home to Victory Lane and a small bit of recompense. On May 15th this year, Cooksey’s car was destroyed in a collision coming out of turn four, and after much time and effort, tonight he was back in a beautiful new car. With the Late Models lined-up on the grid, and over 1500 in attendance, anticipation filled the thick air like the silence of the wind just before the chute opens. And the fans in the stands didn’t have to wait long for the excitement to build as Modesto’s Mike Beeler (6) and Cooksey paced the field to greet the green. Cooksey was quick on the gun as he grabbed the holeshot going down into turn one at which time his statement was heard loud and clear. It certainly didn’t take much imagination for the collective to realize this race would be for second place. From that point forward, Cooksey pulled away to over a straightaway lead as he flew below the checkers in a lop-sided victory. 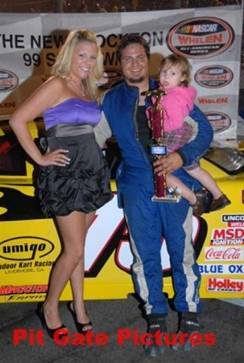 “This is great to win at Stockton,” said the excited young driver, “The last win for me came two years ago at Altamont. So this is fantastic.” The battle for second was heated at times, but in the end it would be Todd Corral (16) of Modesto, in his first appearance of the year, holding off Points Leader Chad Holman (9) of Stockton, who had to settle for what was most likely a disappointing third. Beeler slipped back, if only a bit, to finish fourth. Ripon’s rookie, Michael Sandoval (17), brought her home in the number five spot. By virtue of their finishes on this night, Holman extended his lead over Sandoval to 49 with five races left in three nights. The Grand American Modifieds, after what seemed a long week off, were back in action on the lightning-fast asphalt surface with Modified Sensation, Wes Miller (57) of Turlock, on rails this night all the way through to the checkers. This one got underway with Oakdale’s Ryan Stepps (98), in only his fourth career race, nabbing the pole and Manteca’s David Crouch (2) locked to his right door handle. Crouch jumped out early and appeared strong until lap 9 when Miller slipped underneath him and took control of the number one slot where he would ride it out to the checkered flag waving above him as he crossed below the flagstand in incomparable fashion for his first win of the year at Stockton. “I love racing on this track,” said the well-spoken Miller, “I’ve always had fun at Stockton, and this was fun tonight.“ Crouch, after doing everything he could to maintain a respectable distance to the leader, had to finally settle for second. Stepps finished third, but this young driver appears to improve with each week, which is no small accomplishment in these cars. 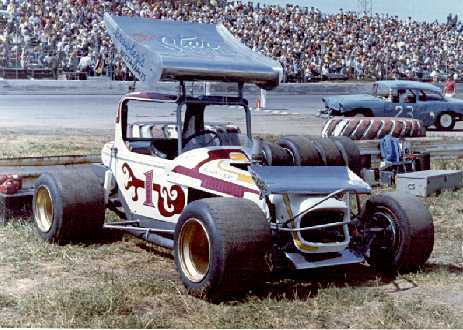 If you love nostalgia, then the Vintage Winged Modifieds had to send shivers up your spine. What a wonderful sight to see these hotrods, after many years, tackling the high-banks once again. Art Gustafson, in his 1969, 327 Red Chevy, would reign supreme on this evening, but not without some great entertainment along the way. The crowd was on their collective feet for the entire race as these guys went back and forth out front and all the way through the pack. By the end of the night, most agreed it would be great to see these cars on more than one occasion during the year. As usual, the Bombers were in great form with Stockton’s Tom Dahl (004) ascending to the top rung of the podium when this one was finished. Stockton driver Fast Freddy Rathjen (290) started P1 with Points Leader Travis Tucker (350), also of Stockton, flanking him to the right. At the drop of the green, Rathjen wasted no time with decisions as he grabbed the lead to prove his strength early on until lap 6 when Fast Freddy’s daughter, Jessica Rathjen (920), washed up the track between turns one and two coming to rest against the outside wall and bringing with her the first caution on the evening. On the lap 6 restart, Rathjen Sr. and Tucker made contact racing to the green which brought out an immediate second yellow and sent Rathjen to the pits for the night. Lodi’s Robbie Knittel (003) and Dahl inherited the front row on the restart and it took Knittel no time to establish himself out front where he would remain for the duration as he crossed the stripe in front of the pack in what appeared to be his fourth win of the year. Unfortunate for the young Knittel, post-race tech would be his undoing when officials discovered the ride-height on the #003 Chevrolet was too low, which handed the victory to Dahl in what would be his fourth win of the season. “I’ve been on both sides of that coin,” said the soft-spoken Dahl, “So we’ll definitely take the win, especially since we were down a cylinder.” Andy Rumsey (043) of Stockton had another great run with a back-to-back second place finish while Jeremy Tucker (051) brought her home on the podium in third. Chevy Hackett came up with another solid race finishing fourth with Fast Freddy Rathjen Jr. rounding out the top five. Points Leader Tucker made it back out on the track on lap 18, twelve laps down, but because of Knittels post-race woes, Tucker was able to extend his points lead to 40. A great lineup was on hand for the Basically-4-Cylinders with Points Leader JD Silva (56) of Modesto coming into the night with a slim eight point lead over Larry Toon Jr. Silva has yet to win a Main Event this year, but consistency rules, and tonight that would not change as Toon crossed the stripe ahead of the pack. This one got up and running with the #6 of Joseph Reichmuth on point and Stockton’s Kelli Bobbitt (61) close at his side. However, coming around to greet the first lap it would be the #101 of Stockton’s Andrew Rumsey, racing double-duty on this night, grabbing the top spot to call his own. Unfortunately, on lap 3, mechanical problems once again collided with Rumsey, ending his night. In the meantime, Toon jumped out to the point where, once there, he wrote his own ticket all the way to the bank as he crossed the finish line, completely unchallenged, for his fourth victory of the year and, by doing so, he completed the rare clean-sweep on the night by winning every race he entered within the division. Modesto’s Richard Hull, starting deep on the grid, brought his #23 hotrod through the field to finish a very impressive second. Stockton’s Kelli Bobbitt (61) notched his sixth top five of the year by finishing on the podium in third with Points Leader Silva coming home in a close fourth, which was good enough to retain his points lead, but only by a tiny two. After a great battle with Silva, Reichmuth had to settle for fifth. What else does one need to say but Legends of the Pacific, and instantly you know you’re in store for some great racing. Although Johnny Morrissey (20M) of Pleasanton would own the checkered flag on this night, it was a stunning visual to watch him get there. Like clockwork, Keith Clement (8) of Stockton and Dave Scaronni (25S) of Sparks, NV led the field to the stripe from row one with Clement jumping quickly to the front until lap 10 when Morrissey began his move on Clement which ended on lap 11 when Clement had no choice but to succumb to the pressure applied to his back bumper by Morrissey. Of course, Morrissey didn’t come alone: he brought with him Donny Darter (99) of Manteca, Stanislov Osterlund (42) of Los Gatos and Tracy’s driving great, Jeremy Wood (22). And on lap 20, the race was on as these four cars continued to jockey for position in what was ultimately one of the finest battles witnessed this year. Although this night would go into the books as a Morrissey night, the other three drivers would hold their heads high as they crossed beneath the checkers with a mere seven one-hundredths separating them from the leader. After the smoke settle, it would be Wood finishing second with Osterlund third and Darter fourth. Clement fell off the torrid pace just a bit, but still came home with a fifth place finish. This was one of those races you wish you had on video, so you could watch it over and over again. Great Race! The Mini Cups were back in action starring Manteca’s Landon Reynolds (57) and Stockton’s Cody Johnston (50). Although Johnston started on pole and led the first lap, Reynolds grabbed the lead going down the back-stretch and never looked back as he crossed beneath the checkers a half-lap ahead of Johnston for his first-ever win at the Speedway in his fledgling career. In Johnston’s defense, he had trouble coming off turn two on lap 6, which at first appeared to be a left rear tire going down, but after further review, the consensus was he drove too deep into the rumble strips. No matter the cause, he was never able to recover from the mishap. However, because of his second place finish, Johnston tallied enough points on the night to send him to the top of the charts for the year. Next Saturday, August 21st, the NASCAR Whelen All American Racing Series returns for the Race For Autism with the Western Late Models, Bombers, Mini Trucks/Mini Stocks, Vintage Hard Tops and the Mini Cups. This Event will be huge for the Western Late Models with $300 to start and $3000 to win. Some big names in the sport will be on hand, which should produce some absolutely great racing. This is one night everyone should have marked on their calendars. Stay tuned for more information yet to come.